E-Zee Tear® Waffle Just Right 1.8 oz. 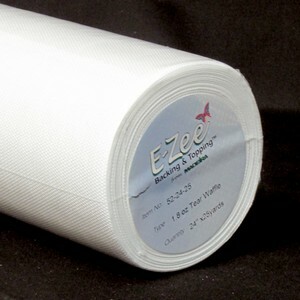 is a medium weight, Tear Away stabilizer. It is ultra soft and has perforations that allow it to be torn away easily without adding stress to the design or fabric . It is ideal for light weight woven and knit fabrics and delicate designs. Note: Made of Polypropylene. Use low to medium iron only. Cut a piece from a roll or use a piece of pre-cut to fit your hoop size. Hoop by placing the backing underneath the garment. Embroider the design and remove the embroidered item from the hoop. Carefully tear the excess backing away, to avoid excess pressure on the design. Helpful Hint: Please note that this backing is made of Polypropylene. Use low to medium heat only when ironing is necessary.